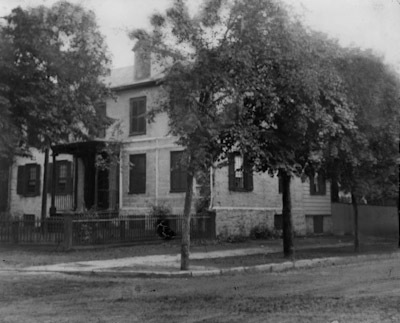 In 1755, Henry Guest purchased two and a half acres on what would become the corner of Livingston Avenue and New Street in New Brunswick. Five years later, Guest built a two-story house, with walls two-and-a-half feet thick, of stone selected from the best in his own quarry on Burnet Street. The outside of the house was stone; inside, the timbers were of stout oak and hand-cut laths were installed and covered with plaster. Two of the four cellar rooms were floored with tiles imported from Holland. Henry Guest carved his name and the date, 1760, in a brick above the front porch, where it may still be seen. The Guest family roots in Philadelphia are reflected in the architecture of the house. The Georgian period home has a strong Philadelphia influence with the use of dark sandstone, small dimensions and regular features. In 1828, when New Brunswick had a population of five thousand, 750 houses, over one hundred stores and twenty taverns, the Guest House was still considered "out in the country," away from the center of town. By then, the piazza had been replaced by the present portico, and the interior woodwork had been altered. The house passed through four owners before it was purchased in 1843 by Reverend John Proudfit, a Latin and Greek professor at Rutgers University. Proudfit built a frame addition around the stone kitchen built by Guest. Many of these alterations remained on the house until it was moved to its new location in 1925, where it now stands on part of Guest's original lot. The Proudfit's frame addition was not moved and the stones from the original Guest kitchen were salvaged and became the new foundation. The house now has four rooms and retains many of the original features.